Alexander Garsden’s Messages to Erice I & II. Photo by Sarah Walker. The title of Speak Percussion’s opening concert sets a playful tone for this year’s Metropolis New Music Festival. The joke was driven home to me when I heard the announcement: “Ladies and gentlemen, Between Two Parts there is an Intermission of a Hundred Thousand Years by Speak Percussion will begin in Elisabeth Murdoch Hall … .” I imagine this title came up during rehearsals, as the ensemble worked out how to switch between the three pieces, each with a different seating arrangement or in a different space entirely. Ultimately there was no such intermission. The ushers herded a willing audience around the building, leaving just enough time to consider the three composers’ distinct responses to the festival’s theme: Music and the moving image. Speak Percussion’s artistic director Eugene Ughetti chose the composers Peter de Jager, Alexander Garsden and Jeanette Little because they are each at a pivotal moment in their careers. Each composer can comfortably forgo the term “emerging” in their biographies, though they are still “young” composers. They inhabit a no-man’s land between the important but largely unpaid opportunities open to students and the networks of commissioners of established composers. 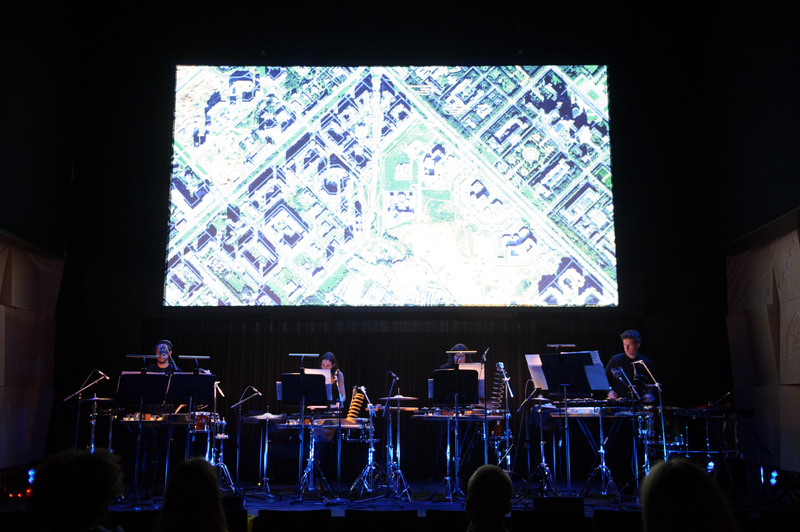 Speak Percussion’s commissions, supported by the Australia Council for the Arts, showed each composer settling into and refining their individual style. Peter de Jager’s Fractured Timelines. Photo by Sarah Walker. The audience took their seats on the stage of the Elisabeth Murdoch Hall for Peter de Jager’s Fractured Timelines. 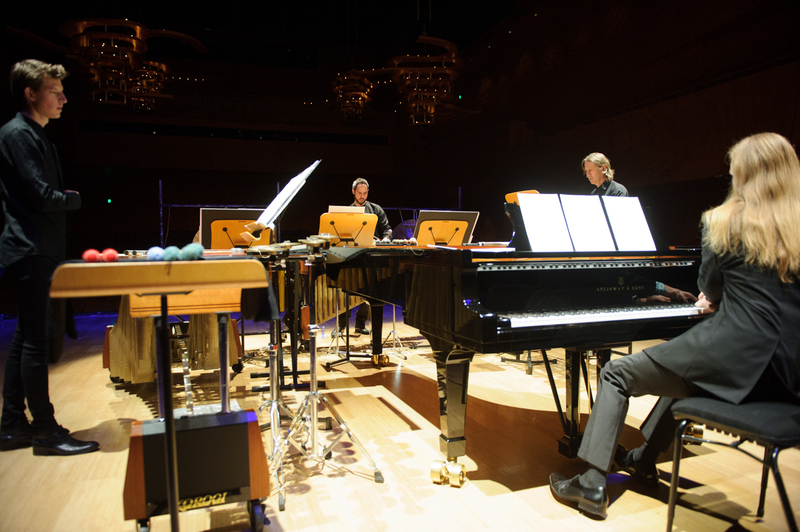 The gleaming keyboard percussion instruments of Peter Neville, Matthias Schack-Arnott and Eugene Ughetti formed three sides of a square around De Jager’s piano, with each performer facing inward towards each other. So intimately close were the audience to the performers that they could follow the coordinating glances of the performers and hear the pedals of the instruments moving. Though designed to project sound out into the auditorium, the stage made an excellent chamber music setting, equalising the natural volume of each instrument. Fractured Timelines is a multi-modal, gestural romp to heaven and back. The piece is structured as a triptych with two roughly inverted movements separated by their “collision.” The first movement moves from ethereal and whimsical arpeggios and melodies down to a rumbling nether-world with highlights of damped cymbals. Instead of avoiding recognisable thematic, tonal and modal materials, De Jager crams Fractured Timelines full of them. Speak Percussion clearly enjoyed shaping the piece’s cellular themes and different instrumental configurations, including many duo and trio passages, shared lines and runs passed between instruments. The third movement moves in the opposite direction, from the dark to the light and back again, ending with a fabulous rolling ostinato in the bass registers of the vibraphone, marimba and piano. The second movement seems less the “collision” of the two exterior movements than its aftermath. Instead of the arching development of the exterior movements, De Jager presents juxtaposed fragments of thematic material, including funereal, plodding piano chords and a whimsical vibraphone solo (I haven’t heard Ughetti play like that for, well, ever). With his thematic riches and multi-modal language, De Jager is like a modern-day Messiaen without god. Like Messiaen, De Jager gives the themes in his scores short descriptions. In De Jager’s case, these descriptions (including “creepy mountain path” and “briar”) are drawn less from sacred imagery than his life-long experience playing video games. Commander Keen is still his favourite. The audience retired to the stalls of the Elisabeth Murdoch Hall for Garsden’s beautiful new work Messages to Erice I & II. Four large tam-tams were arrayed along the front of the stage and lit from below by yellow-gold spot lights. Each tam-tam is fitted with a transducer (like a speaker without the cone). Garsden has made recordings of each individual tam-tam. In the live performance, he manipulates these recordings and plays them back through the instrument via the transducer. The four tam-tams stand there like bronze breastplates, or altars, their mysterious sounds emanating not just toward the audience, but filling the high ceiling of the hall with shimmering, insect-like buzzing and clear, brassy tones. The lights suddenly change to a silvery-blue as the second movement (or “process”) of the piece begins. Here the sound signals are further processed, creating an alien sound world of “washboard” vibrations and fierce roaring. Garsden motivated the festival’s theme in several ways. The algorithmic relationship between the sound-processing of the different tam-tams is related to the relationships of the characters in Víctor Erice’s 1973 film El Spíritu del Colmena. The piece furthermore makes use of recordings, which can be considered moving “sound images.” Most strikingly, the performance itself was a moving cinematic gesture. Jeanette Little’s No Optic. Photo by Sarah Walker. Once ushered into the Salon, we were treated to Jeanette Little’s No Optic for four percussionists and live electronics. The piece is accompanied by a video work by the Russian video artist Sasha Litvintseva. The video features a screenshot of somebody exploring high-resolution Google Maps images of various metropolises. In a reference to online and CCTV surveillance, copies of the screenshots are then dragged onto the screen, producing a multiplicity of staggered images. Scrolling cascades of images of roads and cars pass over the screen. The layering process is repeated with a video of somebody taking a photo with a smartphone. I appreciated that this was a video made almost entirely (if not actually entirely) without a camera. The moving image is now omnipresent, with almost every possible setting and activity recorded and uploaded into the cloud (or into some server farm in a desert). However, I was more amused than scared by the “electronic panopticon” (as it was described in the programme). 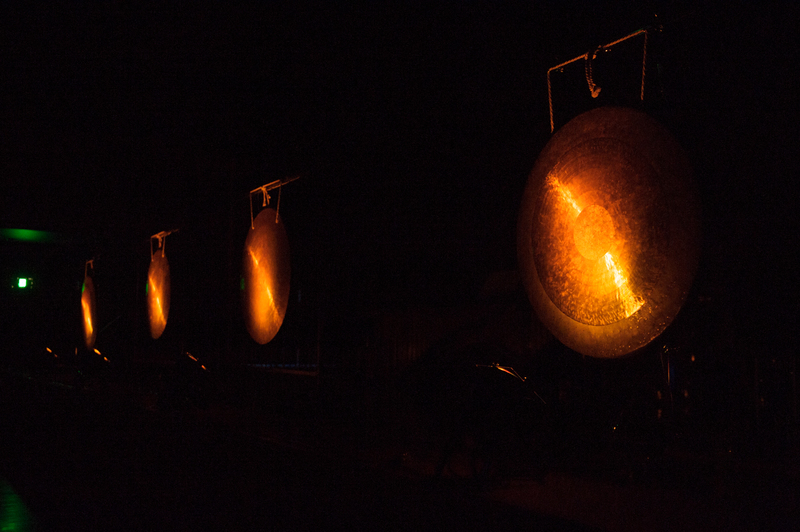 This may be due to Little’s score, which aimed to conjure mixed feelings of “intimacy, discomfort, anxiety and opportunity.” The four percussionists, Ughetti, Kaylie Melville, Anna Camara and Matthias Schack-Arnott, stood behind four almost identical batteries of metal percussion. They produced beds of sound, like the high-pitched rattling of skewers on metal pipes. At other points the ensemble signalled important transitions. For instance, tiled videos of the interiors of trains give way to a single long-range shot of a city with a train passing through it in the distance. The performers stop suddenly, the resonance of car suspension springs ringing out into the calm. The pre-recorded materials, including loud dance music or a sacred classical-era aria, highlighted the omnipresence of recorded sound in our lives as well as recorded images. Composers often regret the lack of opportunities available to them after their first student commissions. By commissioning three confident young composers, Speak Percussion has brought three fascinating and valuable new works into existence. This year’s Metropolis festival is full of such adventurous and intimate programmes by local and international new music stars. Be sure to grab a ticket or three. Peter de Jager, Fractured Timelines; Alexander Garsden, Messages to Erice I & II; Jeanette Little, No Optic.